For other people named Matteo Ricci, see Matteo Ricci (disambiguation). Matteo Ricci, S.J. (Italian pronunciation: [matˈtɛːo ˈrittʃi]; Latin: Mattheus Riccius Maceratensis; 6 October 1552 – 11 May 1610), was an Italian Jesuit priest and one of the founding figures of the Jesuit China missions. His 1602 map of the world in Chinese characters introduced the findings of European exploration to East Asia. He is considered a Servant of God by the Roman Catholic Church. Ricci arrived at the Portuguese settlement of Macau in 1582 where he began his missionary work in China. He became the first European to enter the Forbidden City of Beijing in 1601 when invited by the Wanli Emperor, who sought his services in matters such as court astronomy and calendrical science. 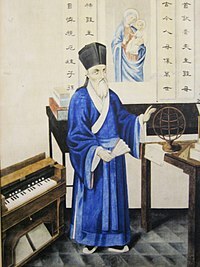 He converted several prominent Chinese officials to Catholicism, such as Xu Guangqi, who aided in translating Euclid's Elements into Chinese as well as the Confucian classics into Latin for the first time. Ricci was born 6 October 1552, in Macerata, part of the Papal States, and today a city in the Italian region of Marche. He made his classical studies in his native town and studied law at Rome for two years. He entered the Society of Jesus in April 1571 at the Roman College. While there, in addition to philosophy and theology, he also studied mathematics, cosmology, and astronomy under the direction of Christopher Clavius. In 1577, he applied for a missionary expedition to the Far East. He sailed from Lisbon, Portugal in March 1578 and arrived in Goa, a Portuguese Colony, the following September. Ricci remained there employed in teaching and the ministry until the end of Lent 1582, when he was summoned to Macau to prepare to enter China. Ricci arrived at Macau in the early part of August. In August 1582, Ricci arrived at Macau, a Portuguese trading post on the South China Sea. At the time, Christian missionary activity in China was almost completely limited to Macau, where some of the local Chinese people had converted to Christianity and lived in the Portuguese manner. No Christian missionary had attempted seriously to learn the Chinese language until 1579 (three years before Ricci's arrival), when Michele Ruggieri was invited from Portuguese India expressly to study Chinese, by Alessandro Valignano, founder of St. Paul Jesuit College (Macau), and to prepare for the Jesuits' mission from Macau into Mainland China. Once in Macau, Ricci studied Chinese language and customs. It was the beginning of a long project that made him one of the first Western scholars to master Chinese script and Classical Chinese. With Ruggieri, he traveled to Guangdong's major cities, Canton and Zhaoqing (then the residence of the Viceroy of Guangdong and Guangxi), seeking to establish a permanent Jesuit mission outside Macau. In 1583, Ricci and Ruggieri settled in Zhaoqing, at the invitation of the governor of Zhaoqing, Wang Pan, who had heard of Ricci's skill as a mathematician and cartographer. Ricci stayed in Zhaoqing from 1583 to 1589, when he was expelled by a new viceroy. It was in Zhaoqing, in 1584, that Ricci composed the first European-style world map in Chinese, called "Da Ying Quan Tu" (Chinese: 大瀛全圖; literally: 'Complete Map of the Great World'). No prints of the 1584 map are known to exist, but, of the much improved and expanded Kunyu Wanguo Quantu of 1602, six recopied, rice-paper versions survive. It is thought that, during their time in Zhaoqing, Ricci and Ruggieri compiled a Portuguese-Chinese dictionary, the first in any European language, for which they developed a system for transcribing Chinese words in the Latin alphabet. The manuscript was misplaced in the Jesuit Archives in Rome, rediscovered only in 1934, and published only in 2001. There is now a memorial plaque in Zhaoqing to commemorate Ricci's six-year stay there, as well as a "Ricci Memorial Centre" in a building dating from the 1860s. Expelled from Zhaoqing in 1589, Ricci obtained permission to relocate to Shaoguan (Shaozhou, in Ricci's account) in the north of the province, and reestablish his mission there. Further travels saw Ricci reach Nanjing (Ming's southern capital) and Nanchang in 1595. In August 1597, Alessandro Valignano (1539–1606), his superior, appointed him Major Superior of the mission in China, with the rank and powers of a Provincial, a charge that he fulfilled until his death. He moved to Tongzhou (a port of Beijing) in 1598, and first reached the capital Beijing itself on 7 September 1598. However, because of a Chinese intervention against Japanese invasion of Korea at the time, Ricci could not reach the Imperial Palace. After waiting for two months, he left Beijing; first for Nanjing and then Suzhou in Southern Zhili Province. During the winter of 1598, Ricci, with the help of his Jesuit colleague Lazzaro Cattaneo, compiled another Chinese-Portuguese dictionary, in which tones in Chinese syllables were indicated in Roman text with diacritical marks. Unlike Ricci's and Ruggieri's earlier Portuguese-Chinese dictionary, this work has not been found. In 1601, Ricci was invited to become an adviser to the imperial court of the Wanli Emperor, the first Westerner to be invited into the Forbidden City. This honor was in recognition of Ricci's scientific abilities, chiefly his predictions of solar eclipses, which were significant events in the Chinese world. He established the Cathedral of the Immaculate Conception in Beijing, the oldest Catholic church in the city. Ricci was given free access to the Forbidden City but never met the reclusive Wanli Emperor, who, however, granted him patronage, with a generous stipend and supported Ricci's completion of the Zhifang Waiji, China's first global atlas. Once established in Beijing, Ricci was able to meet important officials and leading members of the Beijing cultural scene and convert a number of them to Christianity. One conversion, which he called "extraordinary", occurred in 1602, when Li Yingshi, a decorated veteran of the Japanese/Korean War and a well-known astrologer and feng shui expert, became a Christian and provided the Jesuits with a wealth of information. Ricci was also the first European to learn about the Kaifeng Jews, being contacted by a member of that community who was visiting Beijing in 1605. Ricci never visited Kaifeng, Henan Province, but he sent a junior missionary there in 1608, the first of many such missions. In fact, the elderly Chief Rabbi of the Jews was ready to cede his power to Ricci, as long as he gave up eating pork, but Ricci never accepted the position. Ricci's grave (利玛窦墓) in Beijing's Zhalan Cemetery. Ricci died on 11 May 1610, in Beijing, aged 57. By the code of the Ming Dynasty, foreigners who died in China had to be buried in Macau. Diego de Pantoja made a special plea to the court, requesting a burial plot in Beijing, in the light of Ricci's contributions to China. The Wanli Emperor granted this request and designated a Buddhist temple for the purpose. In October 1610, Ricci's remains were transferred there. The graves of Ferdinand Verbiest, Johann Adam Schall von Bell, and other missionaries are also there, and it became known as the Zhalan Cemetery, which is today located within the campus of the Beijing Administrative College, in Xicheng District, Beijing. Ricci was succeeded as Superior General of the China mission by Nicolò Longobardo in 1610. Longobardo entrusted another Jesuit, Nicolas Trigault, with expanding and editing, as well as translating into Latin, those of Ricci's papers that were found in his office after his death. This work was first published in 1615 in Augsburg as De Christiana expeditione apud Sinas and soon was translated into a number of other European languages. Ricci could speak Chinese as well as read and write classical Chinese, the literary language of scholars and officials. He was known for his appreciation of Chinese culture in general but condemned the prostitution which was widespread in Beijing at the time. During his research, he discovered that in contrast to the cultures of South Asia, Chinese culture was strongly intertwined with Confucian values and therefore decided to use existing Chinese concepts to explain Christianity. With Superior Valignano's formal approval, he aligned himself with the Confucian intellectually elite literati, and even adopted their mode of dress. He did not explain the Catholic faith as entirely foreign or new; instead, he said that the Chinese culture and people always believed in God and that Christianity is simply the completion of their faith. :323 He borrowed an unusual Chinese term, Tiānzhǔ (天主, "Lord of Heaven") to describe the God of Abraham, despite the term's origin in traditional Chinese worship of Heaven. (He also cited many synonyms from the Confucian Classics.) He supported Chinese traditions by agreeing with the veneration of family ancestors. Dominican and Franciscan missionaries considered this an unacceptable accommodation, and later appealed to the Vatican on the issue. :324 This Chinese rites controversy continued for centuries, with the most recent Vatican statement as recently as 1939. Some contemporary authors have praised Ricci as an exemplar of beneficial inculturation, avoiding at the same time distorting the Gospel message or neglecting the indigenous cultural media. Xu Guangqi and Ricci become the first two to translate some of the Confucian classics into a western language, Latin. Ricci also met a Korean emissary to China, Yi Sugwang. He taught Yi the basic tenets of Catholicism and gave him several books concerning the west which were incorporated into his Jibong Yuseol, the first Korean encyclopedia. Along with João Rodrigues's gifts to the ambassador Jeong Duwon in 1631, Ricci's gifts influenced the creation of Korea's Silhak movement. The cause of his beatification, originally begun in 1984, was reopened on 24 January 2010, at the cathedral of the Italian diocese of Macerata-Tolentino-Recanati-Cingoli-Treia. Bishop Claudio Giuliodori, the apostolic administrator of the Diocese of Macerata, formally closed the diocesan phase of the sainthood process on 10 May 2013. The cause moved to the Congregation for the Causes of Saints at the Vatican in 2014. Ricci Institute for Chinese-Western Cultural History at the University of San Francisco. In the run-up to the 400th anniversary of Ricci's death, the Vatican Museums hosted a major exhibit dedicated to his life. Additionally, Italian film director Gjon Kolndrekaj produced a 60-minute documentary about Ricci, released in 2009, titled Matteo Ricci: A Jesuit in the Dragon's Kingdom, filmed in Italy and China. In Taipei, the Taipei Ricci Institute and the National Central Library of Taiwan opened jointly the Matteo Ricci Pacific Studies Reading Room and the Taipei-based online magazine eRenlai, directed by Jesuit Benoît Vermander, dedicated its June 2010 issue to the commemoration of the 400th anniversary of Ricci's death. Map of East Asia by Matteo Ricci in 1602. The True Meaning of the Lord of Heaven (天主實義) is a book written by Ricci, which argues that Confucianism and Christianity are not opposed and in fact are remarkably similar in key respects. It was written in the form of a dialogue, originally in Chinese. Ricci used the treatise in his missionary effort to convert Chinese literati, men who were educated in Confucianism and the Chinese classics. In the Chinese Rites controversy, some Roman-Catholic missionaries raised the question whether Ricci and other Jesuits had gone too far and changed Christian beliefs to win converts. Peter Phan argues that True Meaning was used by a Jesuit missionary to Vietnam, Alexandre de Rhodes, in writing a catechism for Vietnamese Christians. In 1631, Girolamo Maiorica and Bernardino Reggio, both Jesuit missionaries to Vietnam, started a short-lived press in Thăng Long (present-day Hanoi) to print copies of True Meaning and other texts. The book was also influential on later Protestant missionaries to China, James Legge and Timothy Richard, and through them John Nevius, John Ross, and William Edward Soothill, all influential in establishing Protestantism in China and Korea. Trigault, Nicolas S. J. "China in the Sixteenth Century: The Journals of Mathew Ricci: 1583-1610". English translation by Louis J. Gallagher, S.J. (New York: Random House, Inc. 1953). On Chinese Government, an excerpt from Chapter One of Gallagher's translation. A discourse of the Kingdome of China, taken out of Ricius and Trigautius, containing the countrey, people, government, religion, rites, sects, characters, studies, arts, acts; and a Map of China added, drawne out of one there made with Annotations for the understanding thereof (an early English translation of excerpts from De Christiana expeditione) in Purchas his Pilgrimes (1625). Can be found in the "Hakluytus posthumus". The book also appears on Google Books, but only in snippet view. 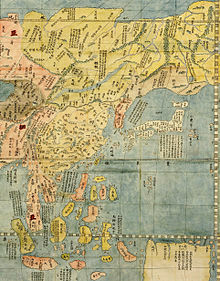 Rare 1602 World Map, the First Map in Chinese to Show the Americas, on Display at Library of Congress, 12 Jan to 10 April 2010. ^ a b Brucker, Joseph (1912). "Matteo Ricci". The Catholic Encyclopedia. New York: Robert Appleton Company. OCLC 174525342. Retrieved 17 August 2017. ^ Baran, Madeleine (16 December 2009). "Historic map coming to Minnesota". St. Paul, Minnesota. : Minnesota Public Radio. Retrieved 12 January 2010. ^ "Ancient map with China at centre goes on show in US". BBC News. 12 January 2010. ^ "Ricci Memorial Centre". Oneminuteenglish.com. Retrieved 14 May 2014. ^ Gallagher (253), pp. 205-227. ^ Chan Kei thong. Faith of Our Father, Shanghai: China Publishing Group Orient Publishing Centre. ^ Li, Zhizao (1623). "職方外紀 六卷卷首一卷" [Chronicle of Foreign Lands]. World Digital Library (in Chinese). ^ "The Tomb of Matteo Ricci". China.org.cn. Retrieved 14 May 2014. ^ Qin, Danfeng (29 March 2010). "At last, they rest in peace". Global Times. Retrieved 10 October 2010. ^ Mungello, David E. (1989). Curious Land: Jesuit Accommodation and the Origins of Sinology. University of Hawaii Press. pp. 46–48. ISBN 0-8248-1219-0. ^ Hinsch, Bret (1990). Passions of the Cut Sleeve : The Male Homosexual Tradition in China. University of California Press. p. 2. ISBN 0-520-06720-7. ^ Zvi Ben-Dor Benite, "Western Gods Meet in the East": Shapes and Contexts of the Muslim-Jesuit Dialogue in Early Modern China, Journal of the Economic and Social History of the Orient, Vol. 55, No. 2/3, Cultural Dialogue in South Asia and Beyond: Narratives, Images and Community (sixteenth-nineteenth centuries) (2012), pp. 517-546. ^ a b c Franzen, August (1988). Kleine Kirchengeschichte. Freiburg: Herder. ISBN 3-451-08577-1. ^ Zhiqiu Xu (2016). Natural Theology Reconfigured: Confucian Axiology and American Pragmatism. New York: Routledge – via Google Books. ^ Bowman, John S. (2000). Columbia Chronologies of Asian history and Culture. Columbia University Press. p. 212. ISBN 0-231-11004-9. ^ "Father Matteo Ricci's beatification cause reopened". Catholicculture.org. Retrieved 14 May 2014. ^ "Diocese to re-launch beatification cause for missionary Fr. Matteo Ricci". Catholicnewsagency.com. 25 January 2010. Retrieved 14 May 2014. ^ "Ricci Hall - The University of Hong Kong". www.hku.hk. Retrieved 17 August 2017. ^ "web.mrck.edu.hk". mrck.edu.hk. Retrieved 17 August 2017. ^ "Matteo Ricci College - Seattle University". www2.seattleu.edu. Retrieved 17 August 2017. ^ "首頁 - Colegio Mateus Ricci". www.ricci.edu.mo. Retrieved 17 August 2017. ^ INSTITUTE, MACAU RICCI. "MACAU RICCI INSTITUTE". www.riccimac.org. Retrieved 17 August 2017. ^ "The Macau Ricci Institute 澳門利氏學社". Riccimac.org. Retrieved 14 May 2014. ^ "Home". www.usfca.edu. Retrieved 17 August 2017. ^ Fordham. "Fordham online information - Academics - Colleges and Schools - Undergraduate Schools - Fordham College at Rose Hill". www.fordham.edu. Retrieved 17 August 2017. ^ "A Jesuit in the dragon's kingdom". H2onews.org. Retrieved 14 May 2014. ^ Category: Focus: The Legacy of Matteo Ricci (20 May 2010). "Interview with Gjon Kolndrekaj". Erenlai.com. Retrieved 14 May 2014. ^ Category: Focus: The Legacy of Matteo Ricci (20 May 2010). "Remembering Ricci: Opening of the Matteo Ricci - Pacific Studies Reading Room at the National Central Library". www.eRenlai.com. Retrieved 14 May 2014. ^ "June 2010". www.eRenlai.com. Retrieved 14 May 2014. ^ Phan, Peter C. (2015). Mission and Catechesis: Alexandre de Rhodes & Inculturation in Seventeenth-Century Vietnam. Orbis Books. ISBN 978-1-60833-474-2. Retrieved 1 February 2017. Note: Phan offers a concise summary of the contents of True Meaning as well. ^ Alberts, Tara (2012). "Catholic Written and Oral Cultures in Seventeenth-Century Vietnam". Journal of Early Modern History. Leiden: Koninklijke Brill. 16: 390. doi:10.1163/15700658-12342325. ^ Halsall, Paul. "Chinese Cultural Studies: Matteo Ricci: On Chinese Government, Selection from his Journals (1583-1610 CE)". acc6.its.brooklyn.cuny.edu. Retrieved 17 August 2017. ^ Ricci, Matteo; Trigault, Nicolas (17 August 2017). "De Christiana expeditione apud sinas suscepta ab Societate Jesu. Ex P. Matthaei Riccii eiusdem Societatis commentariis Libri V: Ad S.D.N. Paulum V. In Quibus Sinensis Regni mores, leges, atque instituta, & novae illius Ecclesiae difficillima primordia accurate & summa fide describuntur". Gualterus. Retrieved 17 August 2017 – via Google Books. ^ "Full text of "Hakluytus posthumus"". archive.org. Retrieved 17 August 2017. ^ Purchas, Samuel (17 August 2017). "Hakluytus Posthumus, Or, Purchas His Pilgrimes: Contayning a History of the World in Sea Voyages and Lande Travells by Englishmen and Others". J. MacLehose and Sons. Retrieved 17 August 2017 – via Google Books. ^ "Rare 1602 World Map, the First Map in Chinese to Show the Americas, on Display at Library of Congress, Jan. 12 to April 10". loc.gov. Retrieved 17 August 2017. Cronin, Vincent. (1955). The Wise Man from the West: Matteo Ricci and his Mission to China. (1955). OCLC 664953 N.B. : A convenient paperback reissue of this study was published in 1984 by Fount Paperbacks, ISBN 0-00-626749-1. George L. Harris, "The Mission of Matteo Ricci, S.J. : A Case Study of an Effort at Guided Culture Change in China in The Sixteenth Century", in Monumenta Serica, Vol. XXV, 1966 (168 pp.). Simon Leys, Madness of the Wise : Ricci in China, an article from his book, The Burning Forest (1983). This is an interesting account, and contains a critical review of The Memory Palace by Jonathan D. Spence. Mao Weizhun, « European influences on Chinese humanitarian practices. A longitudinal study » in : Emulations - Journal of young scholars in Social Sciences, n°7 (June 2010). 職方外紀 六卷卷首一卷 [Chronicle of Foreign Lands]. 1623 – via World Digital Library. This book explains Matteo Ricci's world map of 1574. Wikimedia Commons has media related to Matteo Ricci. University of Scranton: Matteo Ricci, S.J.